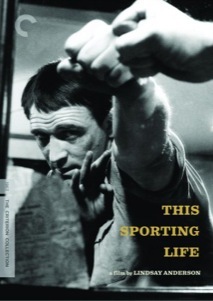 The back cover summary of Lindsay Anderson's This Sporting Life refers to this 1963 film as a "benchmark of kitchen-sink realism," and I suppose that's a fairly succinct description. This is a coarse, workingman British drama, anchored by an Oscar-nominated turn by Richard Harris as the boozy coal-miner-turned-rugby player Frank Machin, whose thuggish on-the-field behavior advances his career, but only serves to make his life more complicated. While the victor typically gets the spoils in a story like this, Harris' Machin seems to only want the seemingly unattainable Margaret Hammond (Rachel Roberts), a woman still grieving over her recently deceased husband. While the machinations of plot are generally compelling enough, some parts of the film's background are almost more so. Case in point with the direction of Anderson, who at the time of This Sporting Life�based on the novel by David Storey, who also penned the screenplay�had never directed a feature film, having spent his career making documentaries and industrial films. There's a rather complex flashback structure to the narrative, the kind of complicated plot device that could have easily turned the film into a confusing mess. The director's presentation of working class Yorkshire, and especially the film's brutal rugby matches, are full of a pronounced and gritty realism that makes the character of Machin seem like a naturally brutish byproduct of his surroundings. My armchair direction might have trimmed the runtime a bit, but Anderson skillfully manages to fill the 134 minutes with a scabby bleakness, as the orbits of Harris and Roberts dangerously overlap. Harris commits a remarkable performance here, turning Machin into an angry and lonely romantic, albeit one who doesn't always know the right way to get his message across. While his wooing of Roberts' Margaret Hammond reveals a glimmer of perhaps another side to his character, sometimes not all that different from his trademark rugby violence, Anderson marries this into of one the film's most awkward sequences. In it, the pair go to a high-class restaurant, which only serves to reveal Machin as a man truly out of his element, and Anderson compounds the uncomfortable embarrassment exponentially. It's a revealing scene, as Machin seems to reinforce that old "tiger can't change his stripes" adage. Credit Storey for not soft-soaping the screen version of his novel, as what he gives Anderson stills packed a gloomy, downbeat punch. And while the script may not always painted a pretty picture, Anderson grimly has it all brought to life by cinematographer Denys Coop (Billy Liar, And Now the Screaming Starts! ), who renders Yorkshire as a cold and shadowy place. Coop's visual brushstrokes reinforce the evolution of the place that gave rise to the hard fisted Machin, and much like the talents of the two leads, are an integral part of the dirty realism. Not always pretty, This Sporting Life is a kick in the teeth. Image Transfer Review: Criterion has presented Anderson's film in its original 1.66:1 aspect ratio. The restoration of this nearly 50-year old film (especially when compared to the mediocre quality of the included theatrical trailer) is fairly impressive, with the result being a black-and-white print that carries a strong degree of detail with very little in the way of specking or debris. Contrast levels work well in both well-lit and darker sequences, with shadow detail and grayscale coverage equally above board. Grain is largely nonexistent. Audio Transfer Review: The Dolby Digital 1.0 mono audio track doles out consistently clear voice quality, though some of the score elements and crowd sounds come across a bit shrilly at times. No evidence of hiss or crackle, and overall a solid, if not uneventful, mono presentation. Disc 1 carries the film, cut into 24 chapters (including one for the standard Criterion color bars), available with optional English subs. A commentary track is included as well, pieced together from separate recordings by Paul Ryan (editor of Never Apologise: The Collected Writings Of Lindsay Anderson) and David Storey (screenwriter/author of This Sporting Life). Recorded in Los Angeles and London in 2007, this is largely Ryan's history lesson, augmented periodically by input from Storey. Ryan's somewhat professorial approach plays nicely against the more personal recollections of Storey, and the wealth of info runs very deep. The original theatrical trailer is also provided. Disc 2 carries five featurettes, led by Lindsay Anderson: Lucky Man? (29m:01s). Made for BBC Scotland in 2004, this 30-minute retrospective of Anderson's career carries input from a number of familiar faces, including Richard Harris, Malcolm McDowell, Helen Mirren, and Martin Scorsese. A trio of Anderson's short films are included, starting with his very first work, the 1948 industrial film Meet The Pioneers (33m:07s), which looks at the ins-and-outs of an engineering company. Wakefield Express (32m:18s) is a 1952 film set in Yorkshire, which was also the town used as the setting for This Sporting Life, while 1993s Is That All There Is? (52m:15s) represents Anderson's final film, an autobiographical piece done for the BBC. An addendum to Meet The Pioneers is the optional Lois Sutcliffe Smith Interview (18m:24s); the woman credited with giving Anderson his first gig recalls her long friendship with the director. The film is a hardscrabble bit of early 1960s British filmmaking cemented by a pair of commanding performances from Richard Harris and Rachel Roberts, but as usual, Criterion has dressed up this release with enough top shelf supplements to make it seem almost scholarly.